Let’s be honest, who doesn’t love pizza? Hailed as a dinner for get-togethers, a reward for a job well done, or a go-to meal for when you don’t feel like cooking, pizza brings the masses together for a feast that everyone can enjoy. With deer season over and your venison tucked in the freezer, let’s put it to good use. 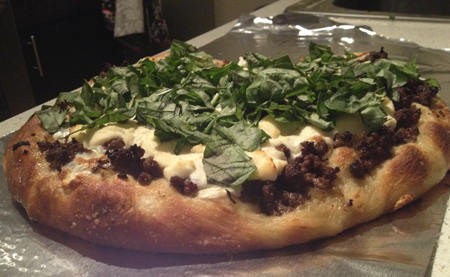 Venison pizza is a hearty dish that any wild-game lover will enjoy. Grilling pizza adds a smokier, crispier taste that will impress your guests and have them asking for seconds. As an added bonus, you don’t run the risk of melted cheese coating the bottom of your oven. So get your grill ready, grab a pizza stone, pizza peel, and get prepared to put an outdoor spin on a classic dish while enjoying the fresh air outside and riding that new e-scooter around the block a few times with the kids before you get started on that pizza. Place the pizza stone on your grill and preheat to 475°. Coat frying pan bottom with olive oil and add butter, melting over medium-low heat. Add chopped onions, salt, and pepper, stirring occasionally until caramelized. Turn up heat to medium-high then add ground venison, stirring constantly and cooking until done. Remove from heat and set aside. Roll out your dough on a floured surface until it’s at least 13” in diameter. Spread olive oil onto dough. Cover dough with onion and ground venison, leaving a 1”-wide edge. Break up mozzarella and ricotta and spread over the pizza. Prior to placing pizza onto the pizza stone, dust the surface with cornmeal. Slide pizza onto pizza peel and transfer to pizza stone. Cook until cheese is melted and crusts turn gold, about 15-17 minutes. Spread basil over pizza, slice, and serve. Forget delivery, restaurants, and the frozen-food section, you’ve got a pizzeria on your own back porch.